Since there is a lot of information available these days on diet and nutrition, it becomes difficult to understand what is relevant or correct. There are pieces of information which are relevant in context to a situation, problem, race or place. However, we tend to generalize it push the same ‘facts’ for everyone in the nutrition field. There are two such categories which are widely misunderstood and misinterpreted. These are calories and RDA or what are known as recommended dietary allowances. Let us look at calories first. Calories are nothing but the energy generated by eating and digesting food. This is in the form of heat. When we eat more than the body’s requirements, the excess is stored as fat. Therefore, calories came in vogue and everyone is obsessed with calories. This is completely incorrect. Each body is completely different so we cannot by go by averages or ranges. Calorie requirements change even for an individual based on activity levels, lifestyles, weather, location, age, stress, illnesses and metabolism changes. So we cannot say that someone needs to have a certain number of calories. It has been found that people having much lower calories are equally or more healthy than those having recommended calories. The biggest culprit these days for unhealthy eating is the focus on calories. We get stressed about the calories we eat. Eating food in this fashion has no meaning. You may start to look thin but you will still get diseases at a later stage. We will see how to tackle this problem. These are standards which are published as to how much of which nutrient to have in a day. Again the problem is the same. Each individual is completely unique. These (RDA) came into being for areas which were constantly in drought, wars, famines or very poverty stricken. For example, there is a certain protein intake recommended. However, protein requirement varies wildly from one individual to another and also based on age, race, physical activity, etc. There are individuals who are more healthy and fit taking half the recommended protein. There are also people who take the recommended intake and are fat and unhealthy or have diseases. Similarly there are RDAs for vitamins and other nutrients. These are no longer good even as guidelines. It only makes us very stressed. Instead of enjoying food, we agonize about it. Food eaten in stress or agony leads to incomplete digestion and absorption. If we are saying that calories and RDAs have no meaning then how do we know how much and what to eat? Food is a part of life. It is not a separate activity from your personality, body and life. Laboratory measurements can never work so long as life is involved. 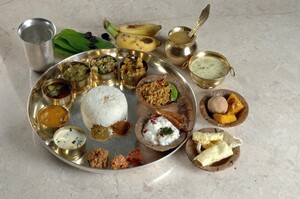 There are some well evolved guidelines and rules for eating as per Yoga and Ayurveda. If we follow these, we will always remain healthy and not become fat. If we are, we will start to lose weight. Do not eat till you are full. Always eat only so much so that you start feeling hungry after three to four hours. At any meal, only fifty percent of your food should be solid. Twenty five percent should be a liquid like soup, milk, dal, kadhi or buttermilk. Twenty five percent should remain empty. Over a period of time, we will automatically know how much to eat. If your physical activity levels drop or likely to drop for a longer period of time, immediately cut down on food. Initially you will feel hungry as per your previous requirements, but the body no longer needs it. When you increase your physical activity, increase your food but gradually. Even then, have more of liquids, fruits and salads. When the climate becomes or hot or you are visiting a much warmer place, consciously reduce food intake and substitute with liquids. When eating out or ordering junk food, eat silently and very slowly. This will ensure you feel full very fast and cannot eat more of unhealthy food. Do not get carried away at buffets, social events and get togethers. Fill up a small plate only once and avoid snacks. If you have starters or snacks then do not have the main course or meal. Eat only so much that satisfies your hunger. Do not force yourself to eat. If on a certain day, you are eating much less than your normal quantity, do not force to eat the same quantity. It is fine to eat lesser than your normal appetite, at times. Just follow these guidelines and listen to your body, not your tongue or mind. To learn how to follow a balanced diet plan and complete all your nutritional requirements with less quantity, take an online diet plan from wellzee.